Keyboard Studies Planner™ is designed to save time at the lesson and facilitate organized practice by meeting the practical needs of both instructor and student. Precious lesson time is saved when using the "most-common" reminders checklist on each of the 48 assignment pages and the step-by-step tips found on the How To Speedpractice sheet. Page design also allows for easy assigning and marking of completed homework assignments. The instructor can efficiently track goals on a comprehensive annual planning page, a technique chart, and a repertoire list. These visual incentives generate renewed motivation and confidence for the student. They also assist the instructor in assessing quickly at a glance a student's progress in preparing for performances and evaluations. Keyboard Studies Planner™ provides a simple grading system for each assignment page and a balanced progress report card at the end of each notebook. The unique vertical three-hole spiral binding is sturdy enough to stand alone or allows students to keep the assignment notebook in their three-ring binder together with other important music papers. 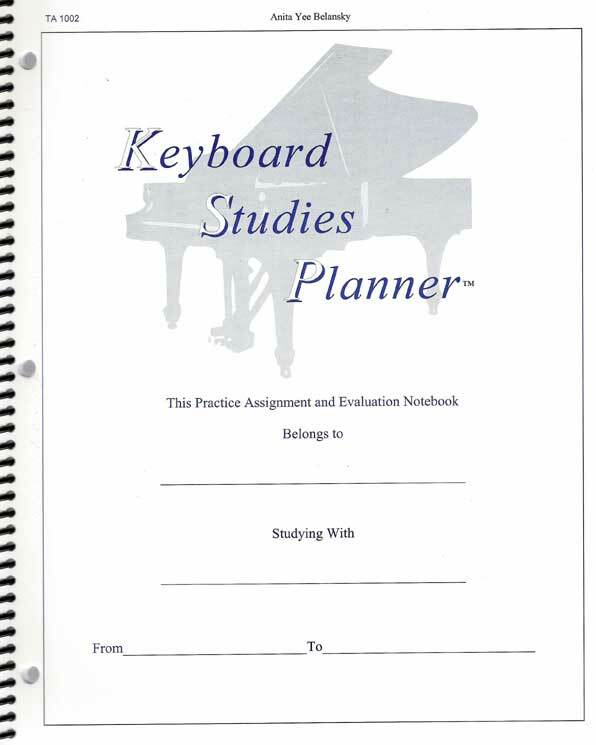 It is the author's hope that Keyboard Studies Planner™ will promote excellence in practice habits which will, in turn, advance keyboard learning toward a lifetime of music-making.